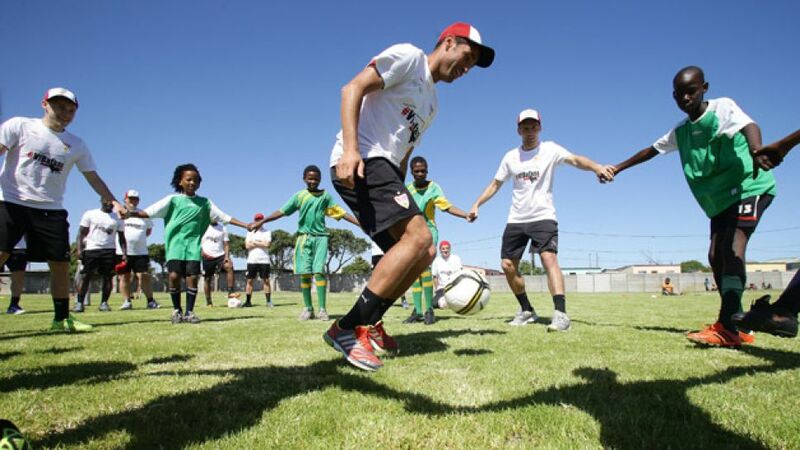 Cape Town - There were smiles all round as VfB Stuttgart paid a visit to Cape Town’s Philippi Township on Monday. Die Schwaben put on an unforgettable show for local children, who were invited to join their heroes for a day of fun, football and good old-fashioned camaraderie. Tunisian defender Karim Haggui, for one, was vociferous in his support of the township youngsters, cheering on his dexterous troupe to the tune of “Hey, Bafana Bafana”, while team-mates Cacau and Gotoku Sakai celebrated wildly as another showed off some fantastic skills in the keepie-uppies department. Home to around 100,000 residents, the township itself is a far cry from the standard of living the VfB camp have become accustomed to back in Stuttgart, home to iconic car manufacturer Mercedes-Benz. “It’s striking to see just how massive the differences can be within one city,” explained Bosnia-Herzegovina international striker Vedad Ibisevic. “It was a very interesting experience for me, but for the kids, that’s just daily life,” he concluded, touched by yet another eye-opening day out in the Rainbow Nation.